Brock Lesnar has some harsh words for the pro wrestling community and The Undertaker. Lesnar called the pro wrestling world jealous of his MMA success and said that he does have a real problem with The Undertaker. Unfortunately Lesnar says their beef won’t be settled at WrestleMania 27. The bad news about Brock Lesnar is that he rarely does interviews. The great news is that when he does do interviews, he rarely ever holds back his true feelings. MMA reporter Ariel Helwani sat down with Lesnar and ironically the two talked a lot of pro wrestling in this MMA interview. Helwani and Lesnar talked a lot about his confrontation with the Undertaker at UFC 121 following his loss to Cain Velasquez. Lesnar seems to be bothered more by the pro wrestling community in general rather than The Undertaker. 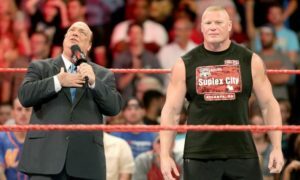 Apparently all of those interviews with Lesnar’s former WWE co-workers who criticized Brock when he left the WWE without putting guys over on the way out or called him out haven’t been forgotten. I think it is a bit ironic that you have a lot of guys in the pro wrestling community that root for Brock as “one of their own” while Lesnar doesn’t seem to want anyone’s support. I wrote about this back in 2009 after Lesnar had harsh words for pro wrestling during an interview with ESPN. In all fairness to Lesnar, he received a lot of criticism within the pro wrestling community for leaving the way he did so the lack of reciprocal love to his ex-WWE comrades really doesn’t shock me. Lesnar also talked quite a bit about the actual confrontation with The Undertaker. Lesnar more or less said that he was disoriented following the fight and was caught by surprise when The Undertaker asked him if “he wanted to do it.” Lesnar laughed and said he doesn’t really know what The Undertaker “wanted to do.” Lesnar further stated that part of him wasn’t even conscious when he walked out of the octagon. As for the heat with The Undertaker, he said that a mutual friend of theirs relayed some comments that The Undertaker made about Lesnar’s life that he “wasn’t happy with”. Lesnar said he responded and thinks that their mutual friend may have passed his response onto The Undertaker. He also said that he hasn’t talked to the Dead Man in a year and a half and really isn’t entirely sure why they have heat but didn’t seem to care either way. This was a fantastic interview by arguably the best MMA reporter in the industry right now. Helwani is not only a wrestling fan, but was the reporter caught in the middle of the Undertaker – Brock confrontation which gave him some unique perspective on the incident. Lesnar and Helwani talk more about the confrontation as well as his loss to Cain Velasquez, coaching The Ultimate Fighter Season 13, and more in a rare interview with MMA’s most polarizing fighter.